Description: I chased 262 toward Binghamton, catching up as the train came into Endwell. He's gaining on me here as I roll down the George F Highway. Description: Red barn 9023 leads three more 40s and 85 cars west from East Binghamton yard. 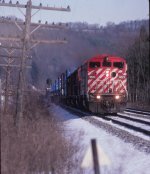 Description: CP 167 rolls west approaching Owego on now removed track 1. Description: I had a good run with this train, catching it at several locations. Hate to waste a sunny day, even if it IS cold!! Description: One of the less seen locations is between Chemung and Wellsburg, along NY 427. Its easy enough to get to, you just have to pass up the easy overhead shot at Chemung-or get it and go like hell to beat the train there, and hope there are no slowpokes. Description: If you look closely above the top of the 5th unit, you can see two old signal masts. This used to be the east end of a siding that Guilford deemed unnecessary and tore it out when they controlled the D&H. 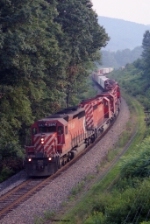 Thanks to this short-sightedness, CP has to deal with 21 miles of single track between CPF-611 in Port Dickinson and CPF-590 near Afton. Description: At this point, 165 had caught up to 413, who was restricted to 30MPH and was having air problems thanks to a bad FRED. 165 would follow 413 into Oneonta, and run around him there. Description: a unit coal train slows to take the siding at ESS Murray. Description: much desired elephant style shot. Description: CP train 38T has just gotten a new crew and is preparing to be taken into the yard after being tied down here at WK all day. Description: Four CP units idling at WK. The second unit is a rare SD40-2F. Description: A grain train is parked on the branch that runs south to Veblen, SD. Description: My 100th CP SD40-2 added to the site trails on 493 today. I hope I can continue shooting these, even trailing, for a while yet. 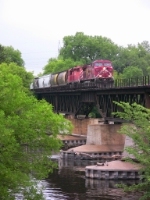 Title: CP 441 at Mile 92 Galt Sub.